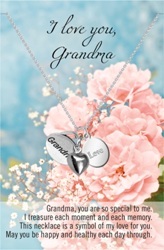 I Love You Grandma necjklace with pewter charms comes with the following poem: "Grandma, you are so special to me. I treasure each moment and each memory. This necklace is a symbol of my love for you. May you be happy and healthy each day through."